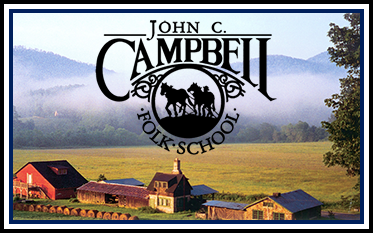 Come to historic John C. Campbell Folk School in the mountains of western North Carolina and savor the natural scenic beauty of our 300-acre campus. Visit for the day and enjoy the Craft Shop, tour the studios, or stroll the nature trails. The Folk School offers over 800 weeklong and weekend classes in traditional craft & art, cooking, gardening, writing, and photography. People from all over the world travel to the school to explore their creativity in supportive, non-competitive classes taught by expert instructors who guide and inspire with joy and understanding. Students stay in on-campus housing and come together for delicious meals, served family-style in the school's dining hall. Visitors are welcome to attend an exhibit of student's work on most Friday afternoons at 5 p.m. Free concerts, featuring old time, country, and bluegrass music are held most Friday evenings, and community dances are held every other Saturday night in the Keith House. Call the school at 1-800-FOLK-SCH for updated schedule information. Engaging hands and hearts since 1925. Come enjoy the making of crafts and good friends on 300 natural, scenic acres in western North Carolina. Call 1-800-FOLK-SCH or visit folkschool.org.